Birding Western Ireland (Josh Jones) Ireland’s geographical isolation has ensured that its avian life is quite distinctive. 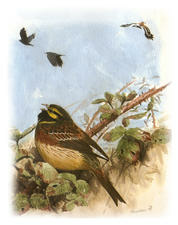 Over 440 species have been recorded, of which almost half are considered to be scarce or rarer migrants/vagrants. It's exposed position in the west of Europe has blessed Ireland with a mouthwatering list of passing seabirds and vagrant American land birds. Many areas are underwatched, allowing the intrepid birdwatcher the chance to find their own rare birds; at the same time, there are many excellent well-established birding sites that give visitors a variety of birdwatching opportunities. This book covers them all. Birding Dordogne (David Simpson & Michel Hoare) The Dordogne is a wonderful area to visit at any time of year and a popular destination for families. This book will help you get the most out of a visit, highlighting the best birding areas and offering advice for your holiday. This iBook is also available in French. The Ultimate Site Guide to Scarcer British Birds (Lee G. R. Evans) When Lee Evans' Ultimate Site Guide was published in 1996 it became an instant classic. For the first time in one place, British birders could discover how and where to see over 100 rarer and more difficult-to-find species. These are the birds that can make birding such an exciting and rewarding activity: there is nothing quite like the thrill of tracking down and observing elusive and attractive species such as Hawfinch, Spotted Crake and Great Grey Shrike. Now NatureGuides has re-published Lee Evans' original guide in a fully revised, updated and extended iBook edition. The information has been carefully reviewed for accuracy and also remembering the need to protect vulnerable breeders. The species accounts have been further enhanced with more than 60 new vignettes from illustrator Ray Scally. For each of the 142 species covered this book tells you all you need to know, including: where to look - up to six pages per species, detailing up to 50 sites, often including maps and grid references when to look - detailed notes explain the best time of year for each site how to get there - and exactly where to look within the site how good your chances are of seeing the bird at each location. All of our iBooks are available on the Apple iBooks Store.